Jay-Z: A Master Of Occult Wisdom? Well, not exactly. 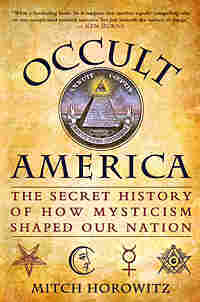 But Mitch Horowitz, author of Occult America, says the rap star is also a shrewd observer of certain secret societies. He analyzes occult imagery in the video for Jay-Z's new single, "Run This Town." Jay-Z: A Master Of Occult Wisdom? Watch the music video for Jay-Z's "Run This Town." 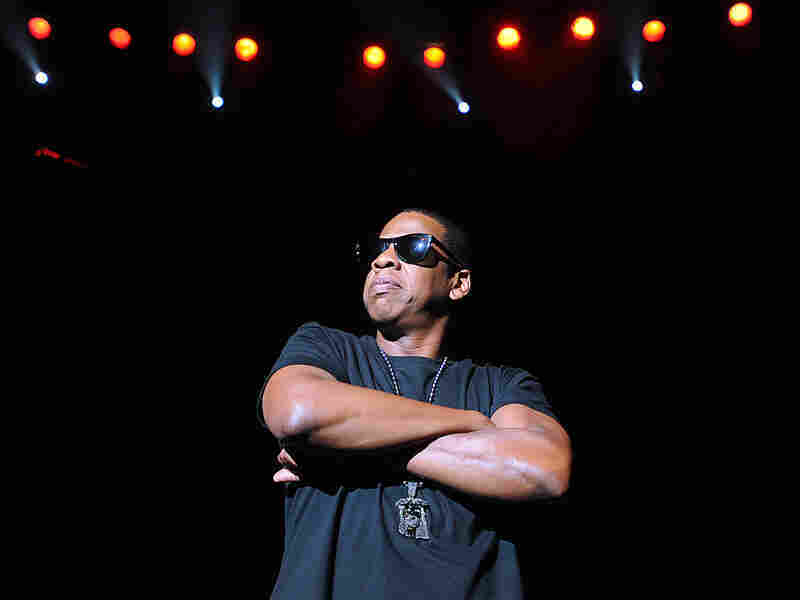 Fresh off the release of his new album The Blueprint 3, Jay-Z performed in London. At this point, the only pop-cultural event that could possibly upstage Jay-Z's new album, The Blueprint III, is Dan Brown's new book, The Lost Symbol. But if Brown thinks he has the market cornered on Freemasonry and the occult, he had better watch his back. Mitch Horowitz, author of Occult America, says that Jay-Z has a keen grasp of certain esoterica, especially in the music video for his new single, "Run This Town." In an interview with Guy Raz, Horowitz pointed to Jay-Z's use of the phrase "Peace God" as an allusion to the Five Percenters. Also known as the Nation of Gods and Earths, they teach that the original black man is God — and that all men are potentially God. "Peace God" is a typical Five Percenter greeting. "A phrase like 'Peace God' does not find its way into someone's vernacular by accident," Horowitz says. "He's making a very definite statement." Of course, Five Percent Nation teachings have had a deep impact on hip-hop for many years. Though not a Five Percenter himself, Jay-Z was born and bred in New York, the birthplace of the movement. So it's common to find such references in rap. But Jay-Z's connection to the occult may extend a bit further. In the making-of video for "Run This Town," he's pictured wearing a sweatshirt with the phrase "do what thou wilt" printed across the chest. "Yes, that has very deep roots in modern occult culture," Horowitz says. "The full expression is 'Do what thou wilt shall be the whole of the Law.' That was one of the key maxims of the British occultist Aleister Crowley. So when Jay-Z appears in a hoodie with that phrase on it in public, that's exactly what he's referencing." Jay-Z's Rocawear clothing line also often draws upon Masonic symbols: pentagrams, obelisks, pyramids, the all-seeing eye. Of course, that pales in comparison with the near-obsession with the occult of someone like, say, Led Zeppelin's Jimmy Page. "I would say that a figure like Jay-Z is probably borrowing some of this material," Horowitz says. "But Jimmy Page was imbibing it even more deeply." Horowitz says he takes a positive view of Freemasonry and occultists — many of the country's Founding Fathers were masons, he says. He does stop short of calling Jay-Z an actual member of a secret society. "I think he's a very shrewd man," Horowitz says. "I think he's a keen observer of everything going on around him. He's a master at using subversive imagery. You don't find your way to Five Percenter material unless you are very aware of what's going on around you." Religious history, like literary or any cultural history, is made by genius, by the mystery of rare human personalities. In the summer of 1693, the philosopher Johannes Kelpius and a small band of followers fled their Rhine Valley homeland. The region had once been a sanctuary of political independence and esoteric spirituality. It was now a charred land of devastation, crushed by the papal Habsburg Empire during the Thirty Years' War. The twenty-one-year-old Kelpius, a protege of mystical scholars who survived in the Rhine corridor, led his German pilgrims to the New World. Fewer than forty in number, they first traveled over land and later endured a five-month sea voyage, which proved less dangerous for the weather than for warring French and British ships crisscrossing Atlantic routes. By late June of 1694, the group reached Philadelphia, then a cluster of about five hundred houses. They settled along the wooded banks of the Wissahickon Creek outside town. There they lived a monastic existence, occupying caves and constructing a forty-foot-square log tabernacle topped with a telescope, from which they scanned the stars for holy signs. By sunlight and hearth fire, they studied astrology, alchemy, number symbolism, esoteric Christianity, Kabala, and other philosophies that had once flowered back home. Newcomers journeyed to America to join their Tabernacle in the Forest, and in the years following Kelpius's death from tuberculosis in 1708, they created a larger commune at Ephrata, Pennsylvania. News drifted back to the Old World: A land existed where mystical thinkers and mystery religions — remnants of esoteric movements that had thrived during the Renaissance and were later harassedcould find safe harbor. And so began a revolution in religious life that was eventually felt around the earth. America hosted a remarkable assortment of breakaway faiths, from Mormonism to Seventh-day Adventism to Christian Science. But one movement that grew within its borders came to wield radical influence over nineteenth- and twentieth-century spirituality. It encompassed a wide array of mystical philosophies and mythical lore, particularly the belief in an "unseen world" whose forces act upon us and through us. It is called the occult. The teachers and purveyors of the American occult — colorful, audacious, and often deeply self-educated men and women — shattered every stereotype, real and imagined, of the power-mad dabbler in dark arts. Rather than seeing mystical or magical ideas as a means to narcissistic power or moral freedom, they emphasized an unlikely ethic of social progress and individual betterment. These religious radicals, acting outside the folds of traditional churches and mostly overlooked or ignored in the pages of history, transformed a young nation into the launching pad for the revolutions in therapeutic and alternative spirituality that swept the earth in the nineteenth and twentieth centuries, even reigniting mystical traditions in the East. In her 1818 novel Frankenstein, Mary Shelley offered a stirring portrait — not sympathetic, but not as unsympathetic as many suppose — of the European occult in the Age of Enlightenment in the 1700s. Her budding scientist Victor Frankenstein was torn between the occult visions that drew him to science as a child and the materialist philosophy of his peers: "It was very different when the masters of science sought immortality and power; such views, although futile, were grand; but now the scene was changed.... I was required to exchange chimeras of boundless grandeur for realities of little worth." In the public mind, the occultist craved immortality, deific power, and limitless knowledge. It was an image that popular occultists often fed. The nineteenth-century French magician Eliphas Levi fancied the occult arts "a science which confers on man powers apparently superhuman." England's "Great Beast" Aleister Crowley extolled self-gratification in his best-known maxim: "Do what thou wilt shall be the whole of the law." The standard-bearers of the American occult took a different path. They sought to remake mystical ideas as tools of public good and self-help. The most influential trance medium of the nineteenth century, Andrew Jackson Davis — called the "Poughkeepsie Seer" after his Hudson Valley, New York, home — enthralled thousands with visions of heaven as a place that included all the world's people: black, white, Indian, and followers of every religion. In early America, the occult and liberalism were closely joined, especially in the movement of Spiritualism — or contacting the dead — whose newspapers and practitioners were ardently abolitionist and suffragist. For women, Spiritualist practices, from seances to spirit channeling, became vehicles for the earliest forms of religious and political leadership. The first American-born woman to become a recognized public preacher was Jemima Wilkinson. In 1776, at age twenty-four, she claimed to have died and returned to life as a medium of the Divine spirit, calling herself the "Publick Universal Friend." The Friend, like the Rhine Valley mystics and Andrew Jackson Davis, remained a Christian. While her claims of supernatural rebirth and spirit channeling fell squarely within the occult framework, her religious perspective was unmistakably Scriptural. For a time, this was the nature of most American occultists (and it would never fully disappear). Few of them expressed any feelings of contradiction between Christian devotion and arcane methods of practice. Eventually, the occult and its acolytes came to branch ever more clearly into a separate and distinct spiritual culture, though not necessarily shedding a Christian moral outlook. In the years between the Civil War and World War II, Americans took a do-it-yourself approach to many aspects of life, including the occult. Their enthusiasms resulted in strange inventions like the Ouija board, a boom in pop astrology, and a revolution in metaphysical mail-order courses and "how-to" guides. Breaking with the habits of the Old World, American occultists often proved wary of secret lodges and brotherhoods; they wanted to evangelize occult teachings as tools that ordinary men and women could use to contend with the problems of daily life. In their hands, methods that had once seemed forbidden or even sinister in the Old World — such as Mesmerism, soothsaying, and necromancy — morphed into a bevy of friendlier-sounding philosophies, some involving mindbody healing, positive visualization, and talking to angelic spirits. The early-twentieth-century progressive minister Wallace D. Wattles, whose writing later inspired the book and movie The Secret, conceived of a psychical "science of getting rich," which he saw more as a program of wealth redistribution than a means of personal enrichment. Similarly, the black-nationalist leader Marcus Garvey attempted to harness the "mind power," or positive-thinking principles so popular within American mysticism, as a path to black liberation. Even at the highest rung of American politics, the Iowan farmerseeker Henry A. Wallace, who served as Franklin Roosevelt's second vice president, drew ethical ideas from his lifelong passion for the occult and envisioned the dawn of a spiritually enlightened "New Deal of the Ages." Since the mid-nineteenth century, denizens of the American occult had foretold a "New Age" in education, cooperation, and inner awakening. In the depth and reach of their careers, in their marriage of arcane methods with self-improvement philosophy, and in their determination to bring mysticism to the masses, they remade occultism into the harbinger of a new era in self-empowering and healing spirituality. Its arcane roots, however, became overgrown and forgotten. Mysteries can be found wherever you look — especially when you're not sure what you're looking for. My brush with the occult began on a quiet Sunday morning in the mid-1970s at a diner in the Queens neighborhood where I grew up, a place of bungalow-size houses and cracked sidewalks that straddles the invisible boundary between the farthest reaches of New York City and the suburbs of Long Island. As a restless nine-year-old, I fidgeted at a table crowded with parents, aunts, and older cousins. Bored with the grown-up conversation, I wandered toward the front of the restaurant — the place where the real wonders were: cigarette machines, rows of exotic-looking liquor bottles above the cashier counter, brochure racks with dating-service questionnaires, a boxy machine that could print out your "biorhythm." It was a carnival of the slightly forbidden. One vending machine especially caught my eye: a dime horoscope dispenser. Drop in a coin, pull a lever, and out would slide a little pink scroll wound in a clear plastic sleeve. Unroll it and there appeared a brief analysis for each day of the month. I was a ripe customer. I had just borrowed a book of American folklore from our local library. It contained an eerie pentagramlike chart over which, eyes closed, you could hover a pin and bring it down on a prophecy: A NEW LOVE; LOSS; GOOD HEALTH; and so on. My prophecy read: A LETTER. At nine, letters rarely found me. But the very next day, one arrived — from the library. My hands shook when I opened it, only to remove a carbon-copied overdue slip. But still. In the 1970s, the supernatural was in the air: I overheard my big sister on the phone discussing whether ex-Beatle Ringo Starr had shaved his head in solidarity with the youth culture's Prince of Darkness Charles Manson. Books on ESP, Bigfoot, and "true" hauntings appeared in the Arrow Book Club catalogs at my elementary school. Friends huddled in basements for seances and Ouija sessions. The Exorcist was the movie that no one on the block was allowed to see. On TV, Merv Griffin and Mike Douglas chatted with clairvoyants, astrologers, and robed gurus. Everything seemed to hint at a strange otherworld not so far away from our own. Or so it seemed that Sunday morning as I bounded back to the table to show off my star scroll. "Look what it says!" I announced, reading out predictions that were always just reasonable enough to come true. "Does it also say you're a sucker?" asked my grandfather, the perpetually exhausted manager of a flower shop. His lack of even the slightest curiosity about the mysteries of the world was as impossible for me to understand as my boyish enthusiasm was for him. While I didn't yet know the lines from Hamlet — There are more things in heaven and earth, Horatio, than are dreamt of in your philosophy — I felt their meaning in my guts. Peering down at my star scroll, I wondered: Where did this stuff come from? The zodiac signs, their symbols, the meanings — all this came from somewhere, somewhere old. But where — and how did it reach Queens? Although I wouldn't know it until many years later, my dime-scroll philosophy contained a surprising likeness to the ideas of Claudius Ptolemy, the GrecoEgyptian astrologerastronomer of the second century A.D. who had codified the basic principles of heavenly lore in his Tetrabiblos. In Ptolemy's pages stood concepts that had already stretched across millennia and followed a jagged path — sometimes broken by adaptations and bastardizations. They ranged from the philosophy of primeval Babylon to classical Egypt to Ptolemy's late Hellenic era to the Renaissance courts of Europe to popularizations of the nineteenth and twentieth centuries and, finally, to the star scroll bought by a nine-year-old one morning in a local diner (a place aptly named the Silver Moon). In Ptolemy's day, astrology remained a mainstay of royal courts and academies, but by the fourth century A.D. it would fall into disfavor under the influence of early Church fathers, who warned that divinatory practices were an easy portal for demonic powers. In the Church's zeal to erase the old practices — practices that had endured throughout the late ancient world (even Rome's first Christian emperor, Constantine, personally combined Christianity with sun worship) — bishops branded pantheists and nature worshippers, astrologers and cosmologists, cultists and soothsayers in ways that such believers had never conceived of themselves: as practitioners of Satanism and black magic. It was a new classification of villainy, entirely of the Church's invention. Once so characterized, the religious minority could be outlawed and persecuted, just as early Christians had been by pagan powers. The fall of Rome meant the almost total collapse of esoteric and pre-Christian belief systems in Europe, as ancient books and ideas were scattered to the chaos of the Dark Ages. Only fortresslike monasteries, where old libraries could be hidden, protected the mystery traditions from complete destruction. By the time GrecoEgyptian texts and philosophies started to reemerge in the medieval and Renaissance ages, astrology and other divinatory methods began to be referred to under the name "occultism." Occultism describes a tradition — religious, literary, and intellectual — that has existed throughout Western history. The term comes from the Latin occultus, meaning "hidden" or "secret." The word occult entered modern use through the work of Renaissance scholar Heinrich Cornelius Agrippa, who used it to describe magical practices and veiled spiritual philosophies in his three-volume study, De occulta philosophia, in 1533. The Oxford English Dictionary cites the first instance of the word occult twelve years later. Traditionally, occultism deals with the inner aspect of religions: the mystical doorways of realization and secret ways of knowing. Classical occultism regards itself as an initiatory spiritual tradition. Seen from that perspective, the occultist is not necessarily born with unusual abilities, like soothsaying or mind reading, but trains for them. Such parameters, however, are loose: Spiritualism is impossible to separate from occultism. Whether believers consider channeling the dead a learned skill or a passive gift, its crypto-religious nature draws it into the occult framework. Indeed, occultism, at its heart, is religious: Renaissance occultists were particularly enamored of Jewish Kabala, Christian Gnosticism, EgyptoHellenic astrology, EgyptianArab alchemy, and prophetic or divinatory rituals found deep within all the historic faiths, especially within the mystery religions of the Hellenic and Egyptian civilizations. They venerated the ideas of the Hermetica, a collection of late-ancient writings attributed to the mythical GrecoEgyptian sage Hermes Trismegistus. The name Hermes Trismegistus meant "Thrice-Greatest Hermes," a Greek term of veneration for Thoth, Egypt's god of writing, whom the Greeks conflated with their own Hermes (and later with the Roman Mercury). The Hermetica reflected the final stages of the magicoreligious thought of Alexandria and formed a critical link between ancient Egypt and the modern occult. ...every event in the visible world is the effect of an "image," that is, of an idea in the unseen world. Accordingly, everything that happens on earth is only a reproduction, as it were, of an event in a world beyond our sense perception; as regards its occurrence in time, it is later than the suprasensible event. The holy men and sages, who are in contact with those higher spheres, have access to these ideas through direct intuition and are therefore able to intervene decisively in events in the world. Thus man is linked with heaven, the suprasensible world of ideas, and with earth, the material world of visible things, to form with these a trinity of primal powers. Bursting forth from the boardwalks, Bruce King knew he had what it took to sell mysticism to the masses. "I felt the competition wasn't great," he told John Updike in The New Yorker in 1959, "and I could become the biggest man in the field." Zolar immersed himself in astrology, Tarot, palmistry, and all the "magical arts," on which he could expound with surprising erudition. "Everything I've ever known I've taught myself," he said. "I've studied psychiatry, sociology, and every field of human relations as well as the occult." For all his have-I-got-a-deal-for-you pitch, Zolar knew his material. His biggest breakout came in 1935, when the dime-store empire Woolworth's agreed to sell his pocket-sized daily horoscopes, the first generation of the mass-marketed horoscope booklets that now adorn the racks at supermarket checkout lines. The secret to Zolar's success was that he spoke in a language everyone could understand. "I'm like the old two-dollar country doctor — a general practitioner," he once said. "If you want a specialist, you go somewhere else." Zolar could even sound like my grandfather when giving a reporter the lowdown on the resurgence of astrology in 1970: "It sounds kind of crazy — but you know that screwy play Hair that has that Aquarian thing?" Zolar was speaking, of course, of the rock musical's rousing opener, "Aquarius." "I think that's sold five million horoscopes." So it had — and in America the old mysteries were on the move.